The model shows the results of the Duffing equation, displaying chaos in movement. This model builds directly on the damped spring model, but this time we’re using a nonlinear spring. This can be represented as a cart with two hollows in it that are separated by a hill. If the cart is shaken by an oscillating force, then a marble placed in one of the holes will oscillate in the hole, and then, unpredictably, will move over the hill into the other hole. The unpredictability of the marble’s movement makes this a chaotic model. The model contains two stocks, V, and Y which are initialized to 0.0. 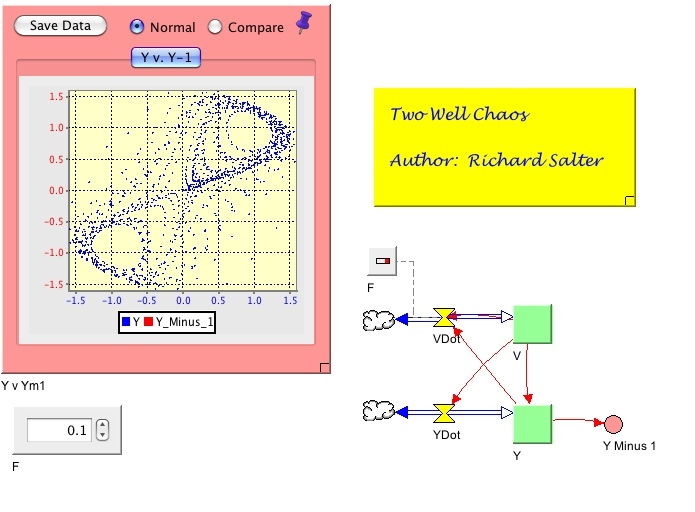 V has a flow labeled VDOT= -V/3 + Y – Math.Pow(Y, 3) + F*COS(TIME()), where F=0.1. Y has a flow labeled YDOT=V. Graphing Y(t) against Y(t-1) in a scatter plot, we can see that every time the sign of Y changes, the ball moves to the other hollow. If there is no sign change, the ball has moved within a hollow.